Over 40 Years of Experience Handling Serious Injury and Wrongful Death Third-Party Accident Cases Throughout All of California – Experience You Can Trust! Information on Workers’ Compensation Benefits and Third Party Claims & Suits for Fork Lift and Industrial Truck Injury Accidents Throughout Los Angeles and All of California. The following is intended to provide some general basic information to guide the employee worker who was injured in a fork lift accident in making a workers’ compensation claim against his or her employer’s work comp insurer and possibly a third party claim against any responsible party who was not his or her employer but contributed to causing the incident and injuries; and also the non-employee worker or bystander in making a third party claim against any responsible parties and their insurers. While the foregoing may be of some general assistance, we always urge the injured victim or the family of a seriously injured victim or person killed in an accident with a wrongful death claim to contact us personally for a more specific, confidential and absolutely FREE case evaluation and consultation for their own particular case. When an employee or worker is injured on the job, including when injured in a fork lift or other industrial vehicle accident, the worker must report the incident and injury to his or her employer and complete the required first report of injury form. The form must be completed as soon as possible and, of course, if emergency care is required the report can wait until the injured worker is able to complete the form after receiving appropriate care and treatment. The injured worker must then usually seek medical care from the list of approved physicians, who are paid by the employer’s workers’ compensation insurance company and NOT by the injured worker. The first doctor, paid by the work comp insurer, usually becomes “the primary treating physician”, and is responsible for the initial diagnosis and making referrals to any specialists needed by the injured worker for the particular type of injuries sustained. The work comp insurer is supposed to pay all necessary and reasonable medical charges and related out-of-pocket expenses so long as they were caused by the covered incident and are from an approved health care provider. The work comp insurer will also pay a portion of lost wages while the worker is in treatment or recovering from the incident and unable to work equal to about two-thirds (2/3) of the worker’s lost wages. These payments are often referred to as “temporary disability payments.” If the injury is found to have resulted in a permanent disability, the injured worker may also receive an additional payment for this “permanent disability”. Third party claims refer to our civil justice system where an injured person makes a claim for compensation (i.e., money or monetary damages) against another party whom the injured party contends is at fault or negligent. The responsible party is often insured and the insurer is responsible to both defend its insured and pay or indemnify any amounts due the injured person. If the parties cannot reach a settlement, then the injured worker, usually with the assistance of an experienced personal injury attorney, may file a complaint with the court to sue for all damages suffered. Third party claims, while requiring proof of fault or liability, also often provide for greater damages than work comp claims. While California workers' comp laws limit a worker’s benefits to hospital and medical bills, certain out-of-pocket expenses, a portion of the worker’s lost wages, and some damages for any permanent disability; injuries caused by third parties may entitle the injured person to additional benefits, including all lost income and profits and damages for all pain, suffering, inconvenience and loss of enjoyment of life activities. One other significant factor to consider is that while most work comp claims may not have any limit, third party recoveries are limited to the amount of insurance coverage maintained by the responsible person or company plus the wealth of that person or company. 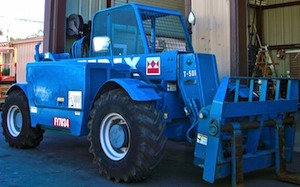 In fork lift accidents, often the owner of the fork lift or employer of the operator of the fork lift may have a large commercial insurance policy, often with additional umbrella coverages of one million dollars or more, so there is a greater likelihood of finding sufficient coverage for catastrophic injuries and wrongful death claims than might be found in a typical car accident case where, most unfortunately, many drivers and/or owners have only the minimum coverage of $15,000. Some are even uninsured. Premises Liability Claims : In third party cases, in addition to the owner of the fork lift and employer of the operator of the fork lift, the owner of the premises may have liability if the premises were found to be unsafe or dangerous. This is called a premises liability claim. The owner of premises has a duty to make them safe for users of the premises. For example, the premises’ surface may be unsafe or materials may have been stacked in a dangerous manner causing them to fall on someone, thereby causing injury and a third party claim for monetary damages against the responsible person or company. If an owner of the premises’ negligence causes injuries to a forklift operator, co-worker or bystander, the injured person may have a legal basis for a third-party claim or civil lawsuit against the owner of the premises. Liability also may extend to others, such as a management company and outside workers, such as landscapers who were contracted to maintain the premises and other contractors who may have caused an unsafe condition, if it is found that they were negligent and their negligence was also a contributing factor. Perhaps an example would be helpful. If employer E leases property from premises owner O and employee EE is operating a fork lift on the premises that tips over because of an unsafe hole on E’s property, then employee EE may make a work comp claim against his employer’s work comp insurer and also a third-party claim against O, the owner of the premises who had a duty to maintain the premises in a safe condition for all users of the premises. To prevent unjust enrichment or double recoveries, if the work comp insurer pays the medical charges and part of the employees lost wages, if and when the injured employee recovers compensation from the insurer of the owner of the premises, the worker may have to reimburse the work comp insurer for money it paid out. Often this amount for reimbursement can be negotiated, compromised and reduced by the personal injury attorney for the injured person, thereby increasing the net recovery of the injured person. Strict Product Liability Claims : A fork lift or powered industrial truck (PIT) can be considered defective or dangerous because of a design flaw or other product defect. If so, the manufacturer of the fork lift, and every company that participated in its sale, may be liable for injuries that occurred as a result of the design flaw or other defect. This is called product liability and comes under the legal theory of "strict liability." Unlike a workers' compensation or a typical third-party negligence claim, a strict liability product defect claim is based on proof that the equipment design or manufacture is flawed and unreasonably dangerous, and the injured party need not prove negligence. An example of a product liability defect claim would be if an operator of a fork lift was burned when a faulty and defective fuel line suddenly broke for no apparent reason, causing a fire and burns to the operator or bystander of the forklift. The injured driver (or bystander) would have a work comp claim against his or her employer’s work comp insurer and also the manufacturer of the defective fork lift as well as the manufacturer of the fuel line. For more information on third-party accident claims when employed workers are involved, please see our section entitled, THIRD-PARTY & PERSONAL INJURY CLAIMS WHEN YOU HAVE A WORKERS' COMPENSATION CLAIM” by clicking here. If you think you have a third-party or work comp claim due to any injury from a fork lift, truck or other accident in Los Angeles, the San Fernando Valley, Riverside, San Bernardino, Ventura or anywhere in California, you should contact an experienced personal injury & wrongful death attorney now for a FREE and CONFIDENTIAL case evaluation. Our personal injury and workers' comp attorneys don't charge for initial accident claims consultations, and our injury lawyers work on a contingency fee basis which means we only earn and receive a fee if and when we win. Thus, if you suffered any serious injury due to a fork lift, lift truck or other truck accident, or if a family member died and has a wrongful death accident claim, or your workers' comp claim involves a disability, consulting with an experienced attorney is essential. You have nothing to lose and everything to gain. You may easily contact us.